i. Tsai Ing-wen made history as the first elected female president when she won the general election for presidency with 56.12% of the votes. She assumed office in 20 May 2016, succeeding Ma Ying-jeou from Kuomintang (KMT). ii. Democratic Progressive Party (DPP) won 68 seats in the 113 Legislative Yuan (Taiwan’s Parliament) thus displacing the incumbent KMT, which ruled Taiwan for a period of 8 years since 2008.
iii. Sovereignty identity is much stronger with the pro-democracy DPP and this will definitely affect the relationship with China. iv. 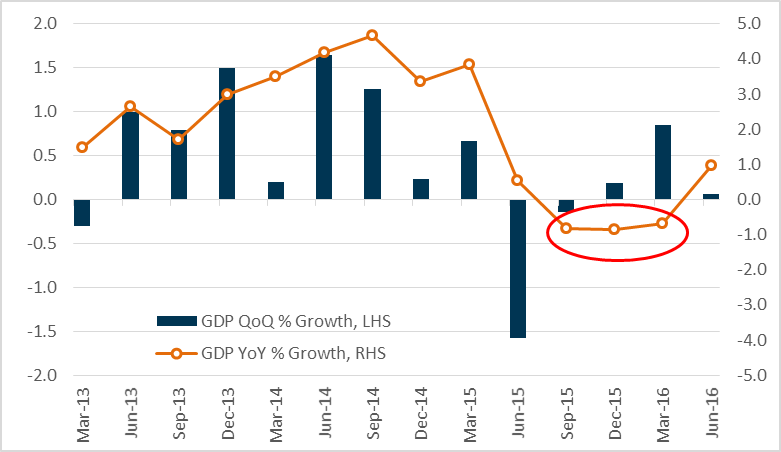 GDP growth in Q2 2016 brings Taiwan out of a technical recession. Export, industrial production and manufacturing PMI seems to be indicating a turning point. v. Taiwan saw a pick-up in foreign direct Investment as investors turn to emerging markets in search of growth. vi. Attractive valuations as the discount for political uncertainties has yet to be lifted and the market has not price in the recent economic recovery. Change of government pathed the way for a different future. The change seems to instil a new found sense of optimism in the people as they embrace the “New Model for Economic Development” led by President Tsai Ying-wen. President Tsai is cognizant of the limitation of the “efficiency-driven” model which has been too export dependent. She advocated a shift to an “innovation-driven” model which features core element such as innovation, job creation and equitable wealth distribution. The economy has shown signs of improvement as macro data reflects a turning point for the economy at the end of 2015. Taiwan GDP registered a positive growth for the first time in the past four quarters in Q2 2016 with a year-on-year (YoY) growth rate of 0.96%. In the same quarter, industrial production recorded its first positive YoY growth in more than a year. Emerging markets are attracting investment funds as investors shake off the scare of a downturn at the start of the year and start searching for growth. There has been a strong flow of funds into the emerging markets, and Taiwan is well-positioned to be a recipient of this investment funds with its democratic society and enterprise spirit of the people. As the pro-democracy DPP takes the helm of the Taiwan government, it is inevitable that political cross-strait tension will arise. China views Taiwan as a runaway state and looks to unify Taiwan in due time. However, the Taiwanese people values their freedom deeply and take pride in their open and democracy society. The risk of an all-out war can be mitigated with sensible leadership from both countries. President Tsai has articulated and reiterated her position of maintaining the status quo and will push for peaceful and stable development of cross-strait relationship. Another potential threat to the revival of the Taiwan economy comes from across the straits as well. Beijing has been aggressive in building home grown chip-making giants. Announcing a US$20 billion fund in their Made-in-China 2025 plan, the Chinese government aim to be a technology juggernaut within 10 years. Dubbed the China ‘red supply chain’, this initiative will post a great challenge to one of Taiwan’s pillars of economy, the semiconductor industries. Taiwan continuous innovation and investment in R&D will be the key in keeping them ahead of the curve. The General Election held in January this year saw a switch of sentiment for the people of Taiwan as the incumbent party, Kuomintang (KMT) lost the election to the Democratic Progressive Party (DPP) for the second time since the country’s democracy. DPP, led by Tsai Ing-wen, won the election comfortable by winning 56% of the votes. The result of this election was not only a reflection of their sovereignty but the outcome highlighted the dismay towards the economic recovery since the global finance crisis in 2008. Since 2011, Taiwan’s economic growth has been weak and inconsistent. The economy recorded negative growth on several occasion as seen in Figure 1. The start-stop to the economic growth casted doubt on KMT’s ability to improve the economy and affected the popularity of Ma Ying-jeou and his party. Furthermore, under Ma Ying-jeou stewardship, KMT expanded Taiwan cross-strait trades with China. During its 8 years tenure, the Ma Administration worked hard to repair the relationship with Beijing and made China his focal point for Taiwan’s recovery. The strategy then, was to ride on the tailwind of China’s enormous growth. This ultimately led Taiwan to an unhealthy dependence on a single market. 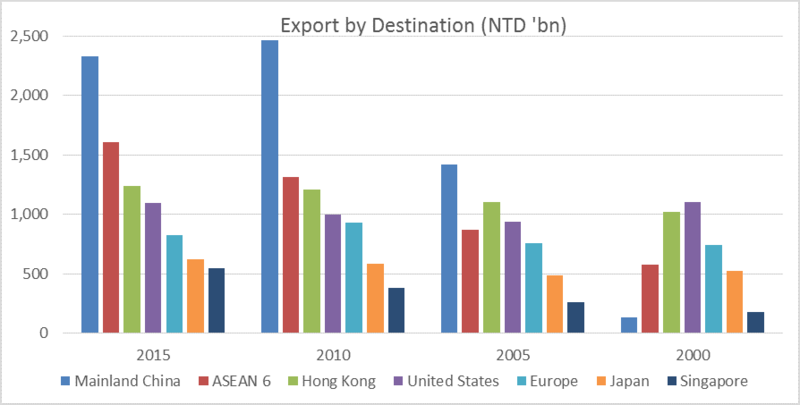 Figure 2 showed the exponential growth of China as an export destination for Taiwan products. As the economical tie with mainland China improves, so did the cross-strait politics. The people of Taiwan are wary of the close relationship between KMT and the Communist Party of China (CPC). Political tension between the Taiwan government and its people heightened when KMT infuriated its citizens by acknowledging the ‘1992 consensus’. (The ‘1992 consensus’ was for both Taiwan and mainland China to interpret the meaning of ‘One China’ according to their own definitions). This tension reached its peak in 2014 with the ‘Sunflower Student Movement’. In a demonstration to oppose the Cross-Strait Service Trade Agreement (CSSTA), a group of student-led protestors occupied the Taiwan’s Legislative Yuan thus starting the movement known as ‘Sunflower Student Movement’. Various services and goods sectors across the straits would be liberalised under CCSTA, harming small and medium-sized enterprises in Taiwan. The protester believed that the trade-pact will harm Taiwan’s economy and leave it vulnerable to political pressure from China. DPP had been very critical of how Ma Administration has handled Taiwan’s economic affair. The New Frontier Foundation, an economic think tank incubated within DPP, has suggested that Ma Administration have failed to identify and developed new economic engine for growth. 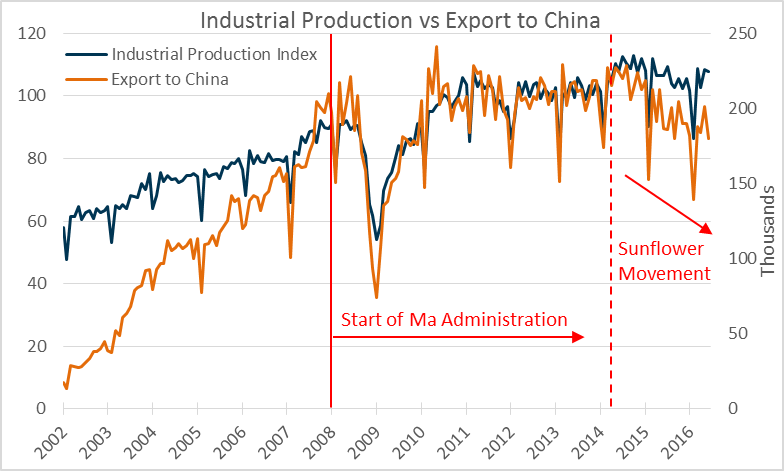 Ma Administration sole focused on improvement free trade with China has led Taiwan into an economic stagnation. The New Frontier Foundation which featured many prominent economic policymakers are now top advisers to Tsai Administration and will take the lead in forming Taiwan’s new economic policies. In general, they have advocated for a more comprehensive growth through innovation, financial sector reform and improving international trades with other countries. In her 2015 speech, addressed to a group of political academics, President Tsai has stated her vision of a better economic relationship with the U.S. Her DPP administration will improve collaboration on the next generation infrastructure on the Internet of Things (IoT), cloud, big-data and ICT-based industries. She further emphasised the need for Taiwan to expand trade relations with more countries and it is crucial for Taiwan to participate in the Trans-Pacific Partnership (TPP) negotiation as well. We have a positive view on the change in the political landscape. Political change are usually accompanied by economic reform. It is paramount that Taiwan retains its economic independence and reduce its risk to a single market. This will boost Taiwan effort in maintaining its sovereignty. Taiwan economy registered its first positive YoY GDP growth in Q2 2016. 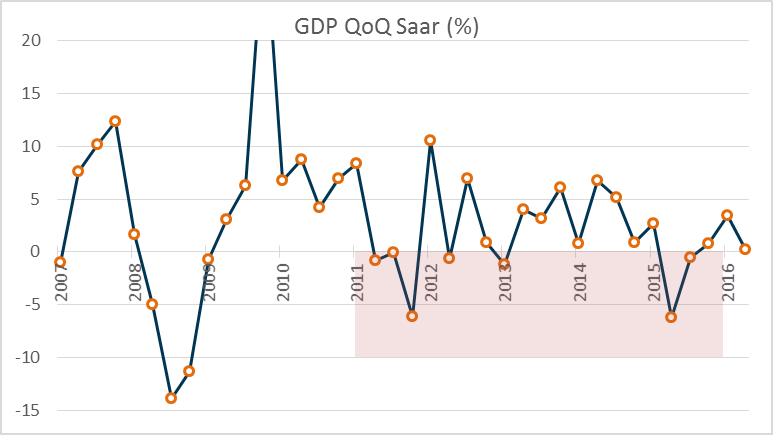 This marked the end of a technical recession for Taiwan which lasted 3Q quarters. We believed that the economy has bottomed out as the initial uncertainty accompanied with the change in leadership subside. Taiwan, as with other East Asia economies, is still very dependent on its exports to spur growth. However, unlike the Southeast Asia economies, Taiwan has position itself at the higher value-added manufacturing supply chain. 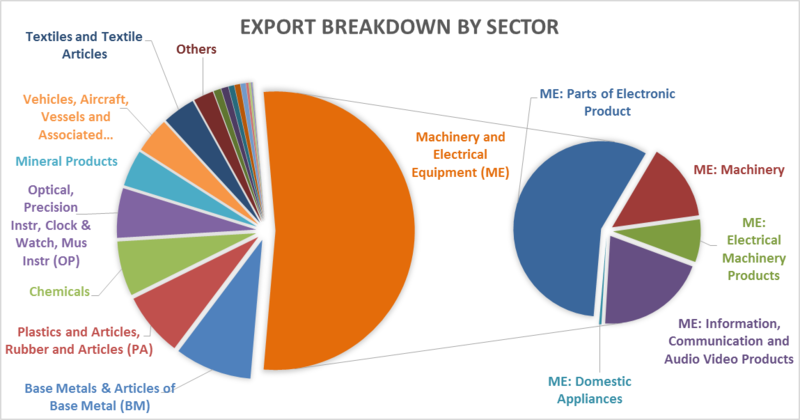 The bedrock of Taiwan’s economy lies in its manufacturing and exporting of electronic products. As at end of 2015, Manufacturing represented more than 31% of the GDP output. As such, manufacturing also accounts for the largest component of the nation’s total industrial production. Therefore if manufacturing does well, industrial production is expected to increase, lifting Taiwan’s overall economy. The industrial production index at the end of July was -0.31% YoY. 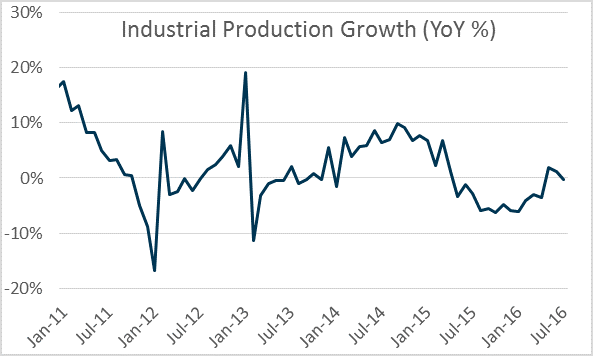 However this small blip will not affect our view that the industrial production has taken a turn for the better after a year of downward cycle. 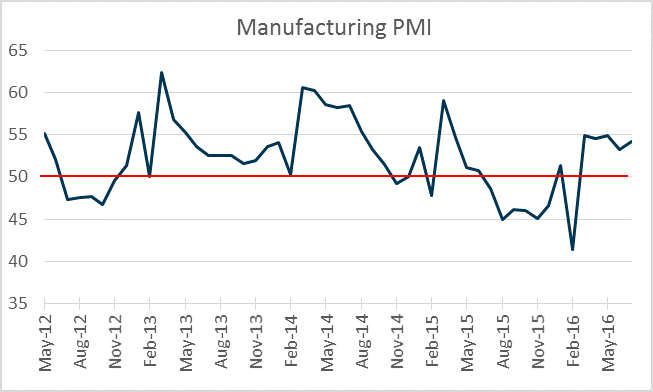 The forward looking manufacturing PMI has remain positive, entering the fifth straight month of expansion. The dynamics of Taiwan’s economy had changed drastically in the past decades. Starting out as a textile and agricultural exporter, Taiwan industrialisation has allow them to be the world’s largest exporter of electronic goods. During their early stages of industrialisation, it has acquired technology from overseas and invested heavily in R&D to keep themselves at the forefront of the information, communication and technology (ICT) sector. This has allowed Taiwan to maintain a sizable trade surplus through the years. However this has created an over-reliance on export for growth and puts Taiwan at a precautious state. 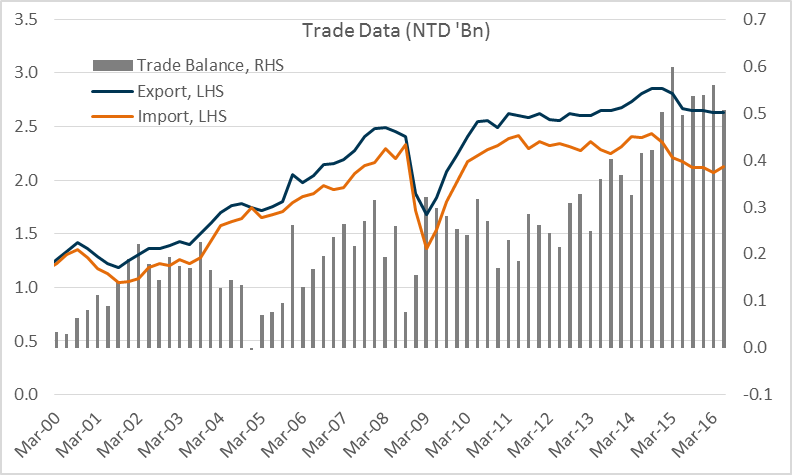 Trade balance as a percentage of GDP have increased and accelerated in recent years due to the rise of China and Taiwan’s focus on cross-strait trade relation. 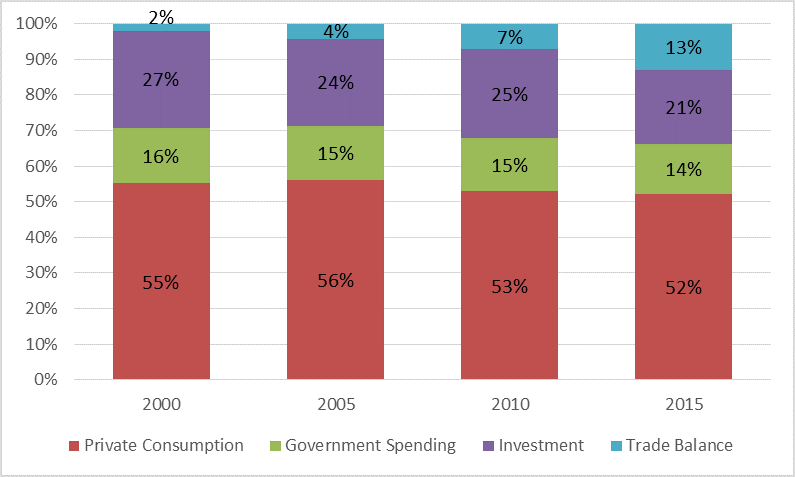 In the past 15 years, growth in net exports has outpaced private consumption and investment resulting in a larger trade balance as percentage to the GDP. The risk of being too dependent on a single market can be identified when we overlay the industry production to Taiwan’s export to China. The strong correlation between the 2 data showed an overwhelming evidence of Taiwan’s vulnerability to any shock in the global demand. Export will remain crucial to Taiwan’s economy in the coming year. However the urgency to restructure its economy beyond just an export-driven country has never stronger. With DPP holding the majority seats in the Legislative Yuan, we expect DPP to layout a more comprehensive growth strategy as they search for growth engine within their shores. 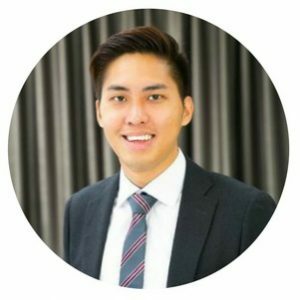 We believe with the help of government support and the entrepreneurial spirit of the Taiwan people, they will be able to build reputable firms which can compete in the ever demanding global landscape. It is not surprising that the Taiex Index which is a proxy for the Taiwan market has c.47% of its weightage in the Information Technology sector. Taiwan Semiconductor Manufacturing Company (TSMC) is the single most heavily-weighted company in the index. It has a c.17% weightage out of the 856 companies in the Taiex Index. Therefore, manufacturing PMI and industrial production suffice to be leading indicators for its economy and thus its stock market. 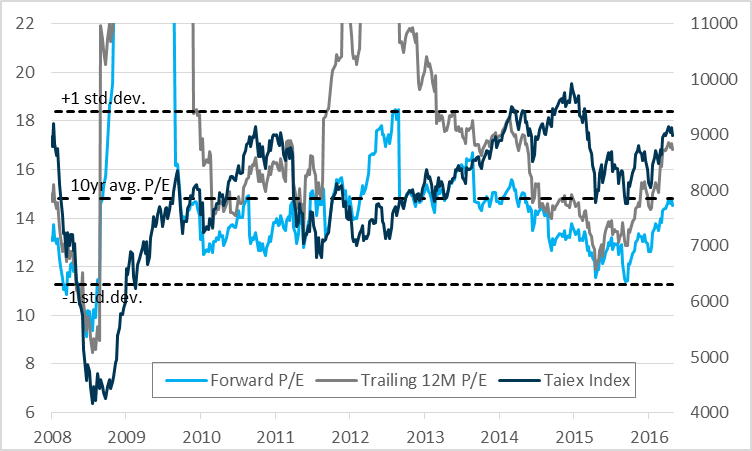 As Taiwan market recovers from its recent low in January 2016, valuations have been attractive as both its forward and trailing Price-to-Earnings ratio (P/E) did not spike up much. Forward P/E are currently at the 10 year average level. Price-to-book ratio (PB) is now at the lower end of the 10 year average. Price was moving in tandem with the PB ratio until 2012, where price and the PB ratio started to diverge. 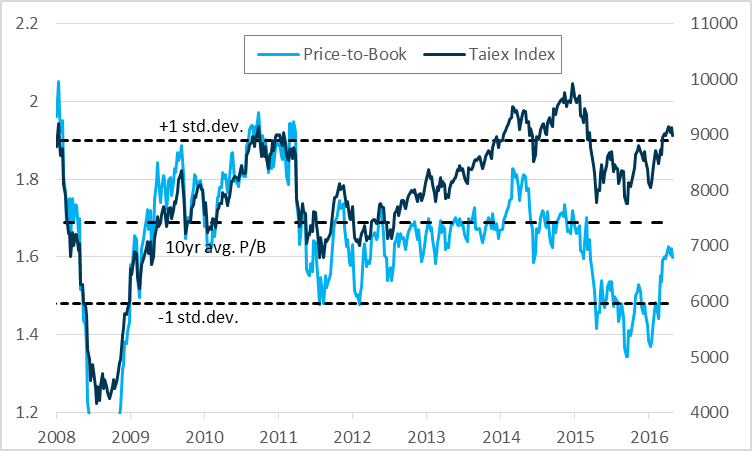 Both forward P/E and PB ratio are suggesting further upside for the Taiex Index as both ratios have reversed and is trending higher. We are now seeing an unprecedented amount of foreign funds investing into the Taiwan capital market. At the end of 2015, there were a total of US$57.2 billion recorded portfolio investment. 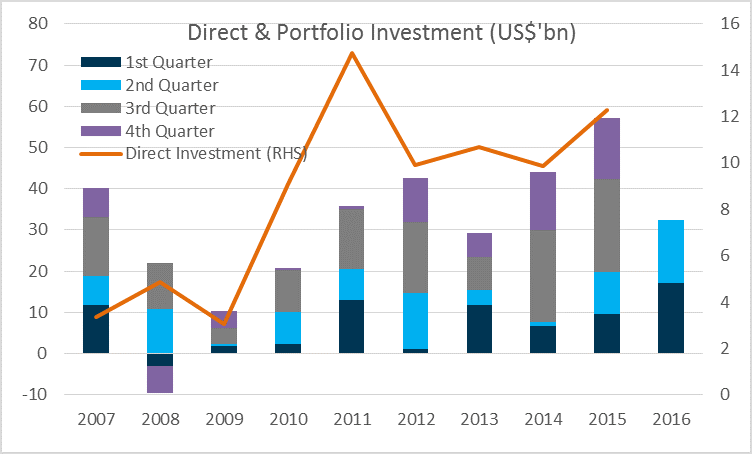 2016 is set to break the previous high set in 2015 as there is already US$32.3 billion of portfolio investment made in 1H 2016, as compared to the US$19.7 billion in 1H 2015. Foreign direct investment which represent funds with a longer commitment has also increased steadily through since 2012. 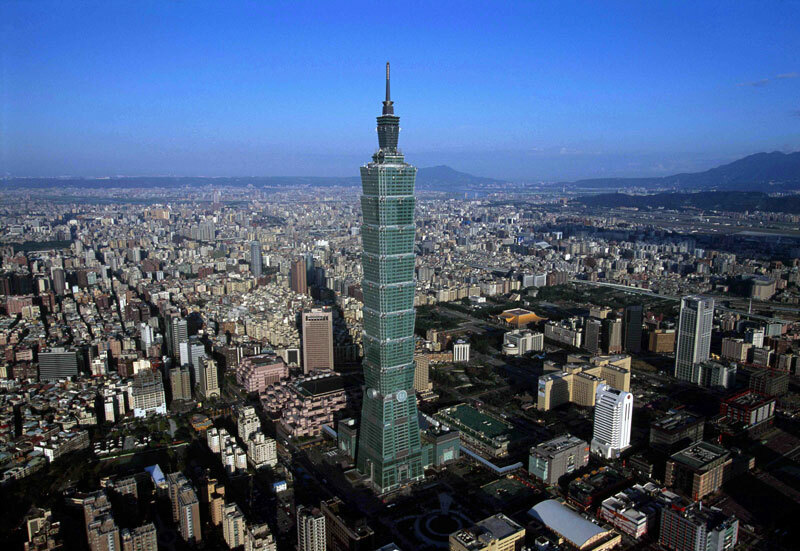 The economy of Taiwan is in a better shape than most of its emerging market peers. Through its initial export-driven model, Taiwan has accumulated a large balance surplus and foreign reserve capital. This will provide Taiwan with a strong fundamental economy to weather any unforeseen exogenous shocks. The strong fundamental will also create some buffer for the new Taiwan government as they transit to a new economic growth model. As DPP assume its role as the new government of Taiwan, there will be a lot of uncertainties. However we believe that it is also the main catalyst of growth. We are positive on the new government and their policies for economic reform. There is also further evidence from the market to suggest that investors are welcoming of the changes. This is reflected in the stock market price action and increasing foreign portfolio investments.